This name uses Spanish naming customs: the first or paternal family name is Hermosillo and the second or maternal family name is Goytortúa. Carlos Manuel Hermosillo Goytortúa (born 24 August 1964 in Cerro Azul, Veracruz, Mexico) is a Mexican former football player. He is one of the top all-time goalscorers for the Mexico national team. He is also known as El Grandote de Cerro Azul (The big tall one from Cerro Azul). He currently works as an analyst for Telemundo Deportes. Hermosillo started his club career with América during the 1983–84 season. He spent most of his club career in his native Mexico, also playing for Monterrey, Cruz Azul, Necaxa, Atlante, and Chivas. Carlos' best two seasons as a player were in 1994–95 and 1995–96, when he scored 35 and 36 goals respectively for Cruz Azul. Hermosillo made two stints of career football outside Mexico: Belgium's Standard Liège in 1989–90 and Major League Soccer's Los Angeles Galaxy in 1998–99. For Galaxy, he scored 14 goals and 15 assists in two regular seasons, adding five goals and an assist in the playoffs. On 17 August 1986 he sparked an all-out war with Guadalajara's Fernando Quirarte that included others from either side; he was suspended for 12 games. 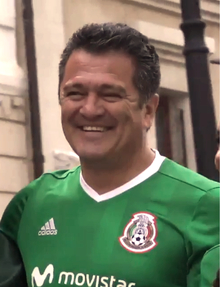 Hermosillo was once the all-time goalscoring lead for the Mexico national team with 35 goals (90 caps between 1984 and 1997). He played in the 1994 FIFA World Cup. Since 1 December 2006, Carlos Hermosillo was named the minister of Mexico national sporting policy, Comisión Nacional del Deporte (National Commission for Sports). President Felipe Calderón included him in cabinet-level matters. With an 18-year career with eight different clubs, Hermosillo retired. He last played with Guadalajara in 2001. He had a retirement game playing with Cruz Azul, his favorite team before professional play was Cruz Azul, also he won a championship with Cruz Azul in 1997.